Highfields, a rural town on the outskirts of metropolitan Toowoomba, is 12 km north of the city's centre. It was probably named after a Highfields pastoral run, north of where the township was formed. The well-timbered Highfields area attracted timber-getters and by the 1860s there were numerous sawmills operating in the district. The passage of the Lands Act 1868 attracted further settlement, as did the 1867 completion of a narrow gauge railway line from Toowoomba to Ipswich, ascending the main range through Highfields to Murphy's Creek. Many of the rail workers remained in the Highfields district once the line was complete. The railway transported timber, and shortly afterwards dairy produce from the farm selections taken up on the cleared hills. Highfields village began in the 1870s with a school (1870) and a Lutheran church (1879). The post office directory (1924) recorded the Highfields store, the Range View Hotel and a white steepled Lutheran church (1907). About half the farm families had German names. The main township in the area was Carbarlah (north of Highfields), and its court house became administrative offices of the Highfields local-government division (proclaimed 1879). From 1883 Cabarlah enjoyed a short-lived status as a regional railhead when the second rail line extending from Toowoomba terminated at the town, prior to its extension to Crows Nest three years later. 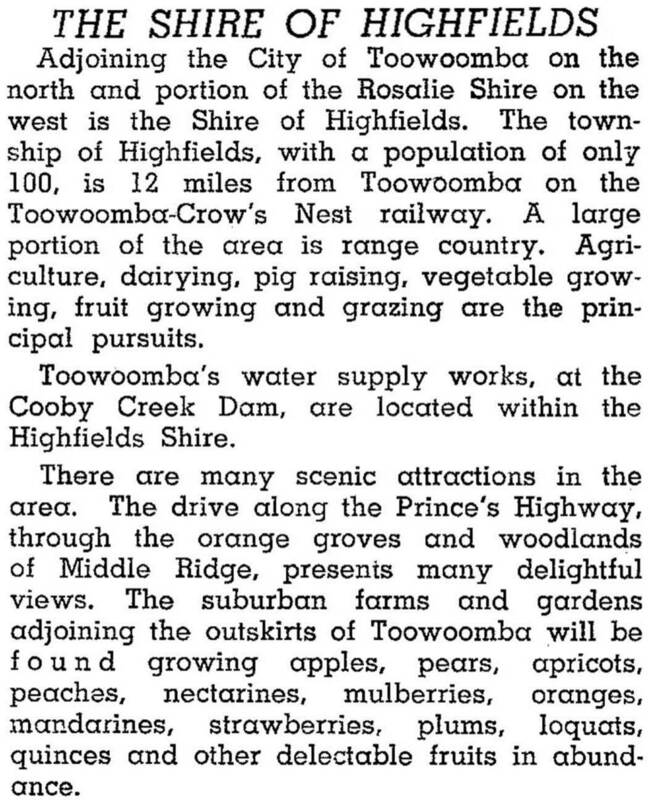 Upon the publication of the above, Highfields Shire was no more, amalgamated with Crows Nest Shire in March 1949. While the original shire may have declined and disappeared, the township of Highfields has experienced considerable urbanisation, developing as a satellite community of Toowoomba. In 1991 Highfields' population overtook that of Crows Nest, and during the next ten years grew almost threefold, comprising over one-third of the entire Crows Nest Shire population by 2001. Subdivision of former dairy properties has resulted in considerable rural-residential, and ancillary development; a drive-in shopping centre and indoor sports centre were opened in 2003-04. Highfields has a comprehensive shopping centre, a cultural centre, a pioneer village, a swimming pool and other recreation facilities, a primary school, Toowoomba Christian College (1979), and a Catholic primary school (2003). *After severance of Crows Nest.